While most subway buffs consult David Pirmann’s NYC Subway for looks at subway maps and active and retired subway cars, I occasionally look through it for subway platform lamp stylings over the years. Subway platform lamps are a self-contained genre and contain a number of species that are used on platforms throughout the system. In recent years, the MTA has been bringing back some of these formerly used styles, no doubt consulting older photographs from NYC Subway as well as libraries for blueprints and schematics. I am veteran rider at the Queensboro Plaza station. When I lived in Bay Ridge, the R train deposited me there so I could cross the platform and get the #7 train to Shea Stadium. When I moved to Queens I wold catch the #7 from its Long Island Rail Road transfer at Woodside and take it to Manhattan or grab the R (or the N, after 1987) at Queensboro. 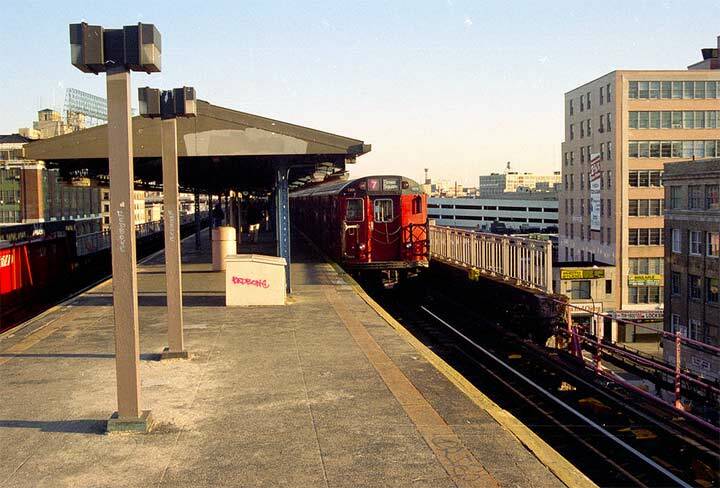 In the early 2000s a free transfer was also effected at Court Square to the E, M and G trains. I am also a keen observer of lampposts as most FNY readers know. I’ve found it difficult to do a comprehensive survey of elevated train platform lamps. It’s time consuming to get off at each station, photograph the lamps, and get wait for the next train. 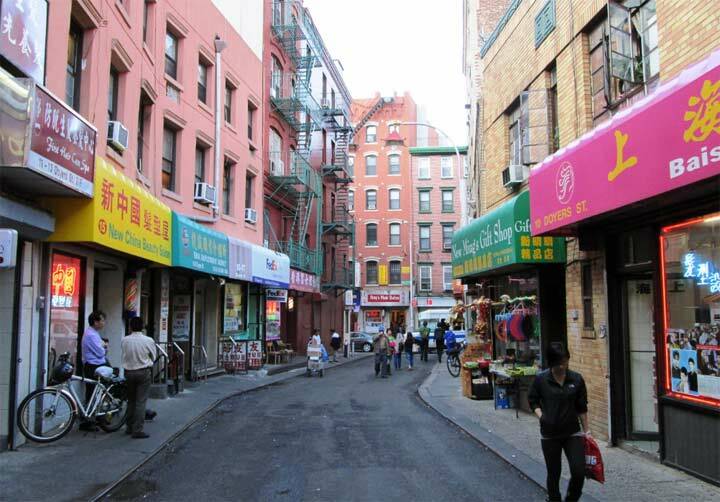 Still, I intend to undertake this effort for each elevated line sometime soon. In the meantime I’ve noticed an unfortunate change from a design and esthetics standpoint at Queensboro Plaza I want to discuss today. 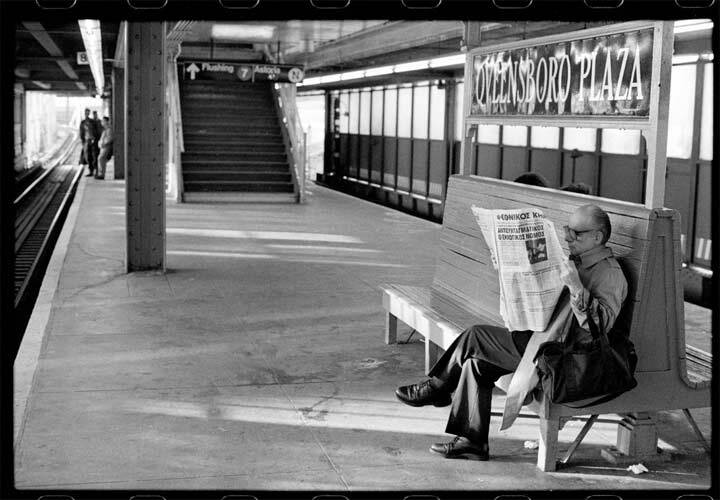 From NYC Subway here’s an evocative shot of the west end of the Queensboro Plaza platform in 1968. A RR R-16 car is on the left, while an R-36 World’s Fair Special trainset sits on the #7 tracks. 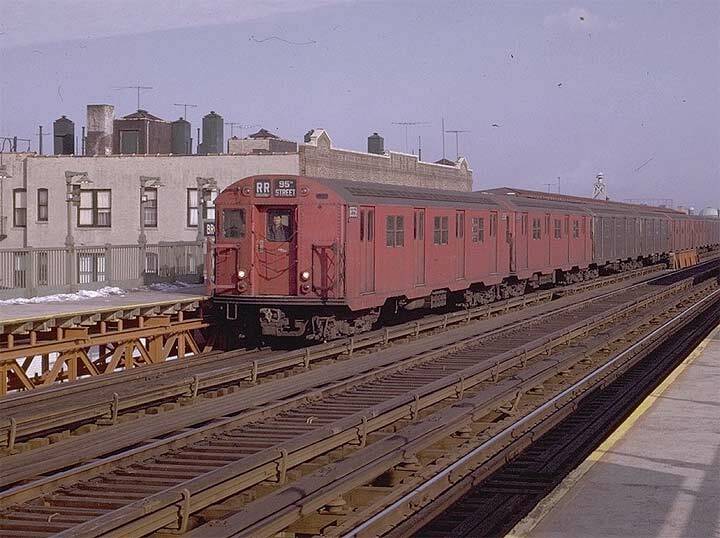 For several decades the IRT and BMT jointly operated the Flushing and Astoria Lines, until the BMT got the Astoria and the IRT got the Flushing in 1949. Thus, this remains the only place in the NYC subways where the IRT and BMT can be accessed across the same platform. There is a track connection, but it’s not used for passenger service. The Queensboro Plaza station opened on April 21, 1917 and so celebrates its centennial this year. It’s quite likely these are the same relatively thin lamp stanchions, with wider bases, tapering shafts and incandescent bulbs, that had been in use since 1917. I got this shot in the summer of 2015. An N train with R-68 cars is pulling in (R-68s are now rare on the N but can be seen more often on its running buddy, the W). 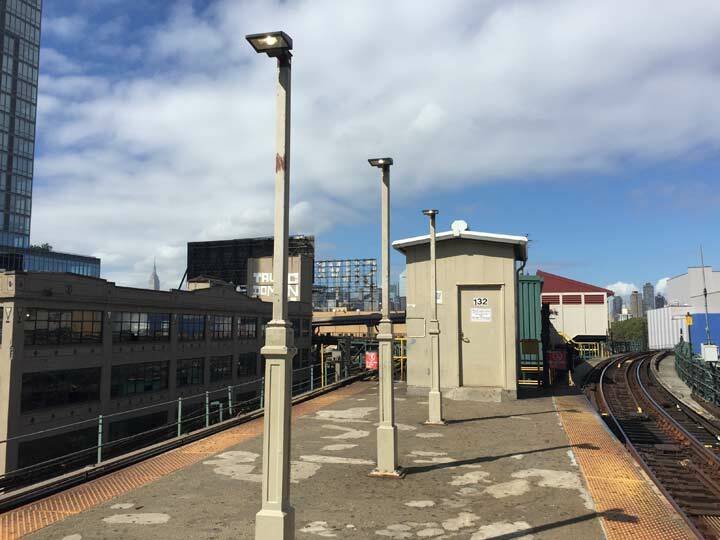 In 2000, the sodium lamps were replaced with a style harking back to the original 1917 lamps, but this time with fluted “hoods” reminiscent of those seen in other BMT stations. 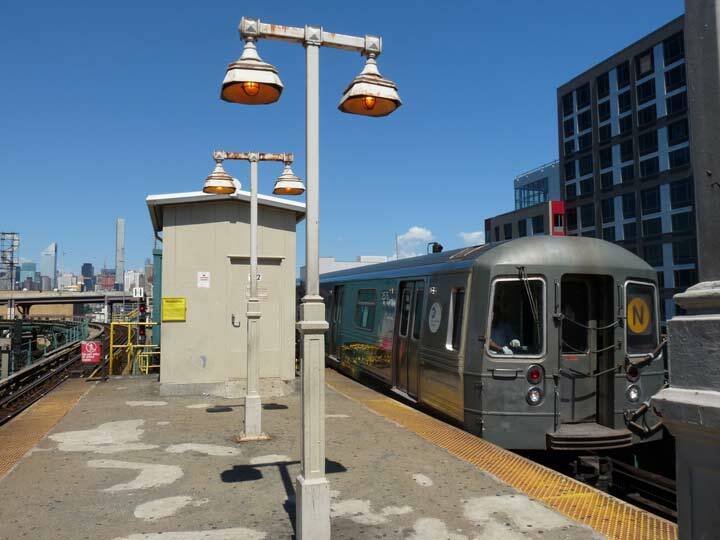 Several BMT stations have been using similar lights, such as Sheepshead Bay and 9th Avenue (B, Q). The bulbs were once again yellow sodiums. While waiting for the N in September 2017 I was disappointed to see that the BMT “hoods” have been lopped off and replaced by one lone Light Emitting Diode fixture per each post. I do not know why LED bulbs could not simply have been screwed into the sockets in the old heads, but the MTA no doubt has its reasons. Elsewhere on the Astoria Line, this approach had already been taken years ago. Here at Broadway, old standards mounted on the station railing have been maintained, but with sodium lamps mounted at their apices. 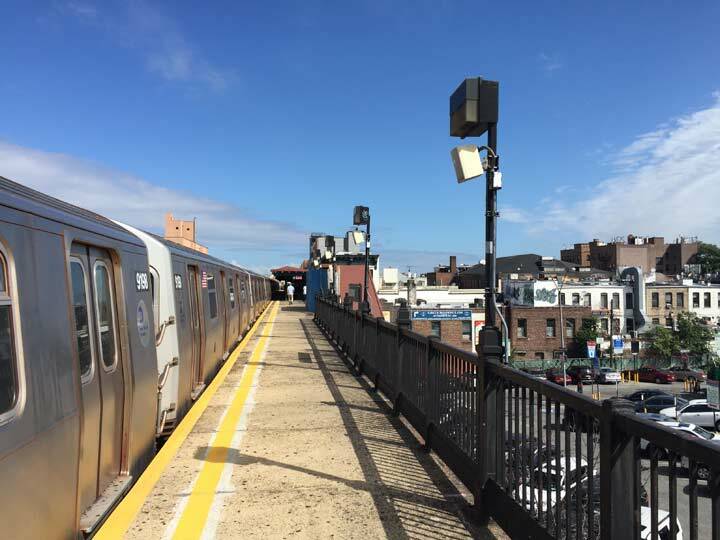 Since a number of stations on the Astoria Line will be renovated in upcoming years, I wonder of new LED fixtures will be placed here, or they may use the old posts as here. 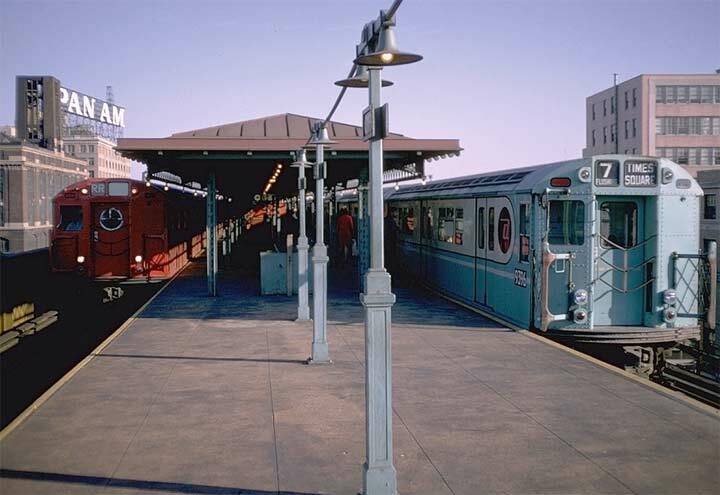 In 1970 a set of R-30 cars on the RR line enters Broadway. Beginning in 1978, double letter lines were assigned single letters; formerly, double letters on a subway line indicated local service — in most cases. Here we can see those railing-mounted standards holding their original BMT incandescent lights. If I may correct you, Double Letter route names went away in 1985. That’s how the 8th Ave Local became the K, replacing AA. 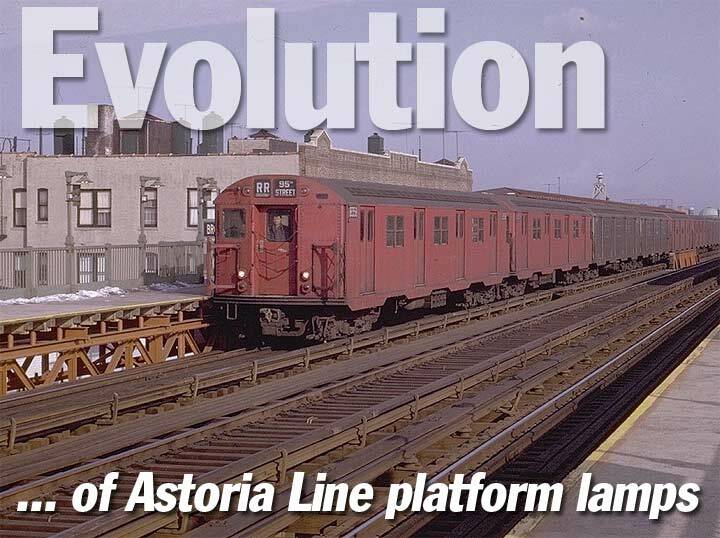 The last major renovations to the Astoria line was in 1986-87. I had to work a 4-12 evening shift in November 1986. Getting off the train at 1am at 30th Avenue,I’d find the NYTA lighting crews running conduit for the fuorescent and high pressure sodium lighting. The work also included new floors in the mezzanine and closing the mezzanine windows with sheet metal. Those windows allowed a nice view east and west along the avenues. I guess they got tired of replacing the the glass. My memory is fading,but it might have been during this same period that the token booths and turnstyles were moved to their present positions. For your home, screwing in an LED replacement works OK, since most bulbs are designed to dissipate the heat and radiate light in all directions. Commercial lighting is more demanding on where the light can radiate out of the fixture.